Trump and Israeli Prime Minister Benjamin Netanyahu are expected to meet today. Hixson is distinguished professor of history at the University of Akron. He is author of the just-released Israel’s Armor: The Israel Lobby and the First Generation of the Palestine Conflict (Cambridge University Press). In his talk on Friday at the “Israel Lobby & American Policy Conference,” Hixson said that the lobby has been political armor for Israel for decades. 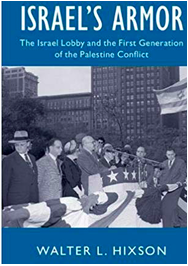 Israel found early on it “could massacre people and rely on the lobby to effectively manage the political fallout.” The conference was on C-SPAN. Hixson’s past books include American Settler Colonialism and The Myth of American Diplomacy: National Identity and U.S. Foreign Policy.